Similar to previous editions, the fourth edition of the Stucco Resource Guide, published in 2016, contains information on the properties of stucco, a comprehensive guide specification, thickness tables and a quality-assurance program. This edition also includes information on continuous insulation systems (CIS), water-resistive barrier systems (WRBS), EIFS, one-coat stucco and over 200 updated drawings illustrating the proper design and installation of exterior cladding systems. It also includes a general update of all divisions and incorporates various indexes to help the user quickly find answers to questions relating to stucco as an exterior cladding. First published in 1997 as the first comprehensive manual to designing and building with stucco, the Stucco Resource Guide covers all scopes or stucco work. 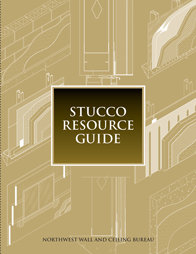 The fourth edition of the Stucco Resource Guide is available in print and digital formats.